Metal roofing has been used for over a century, but has recently grown to be among the most commonly used roofing materials. Its popularity is due to its durability, array of different styles and relatively low cost compared to other roofing materials. Among the benefits, metal roofing is also much faster and easier to install, making it an optimal replacement for just about any roofing type, including shingles. The installation can be successfully completed by almost anyone with the proper tools and instructions. 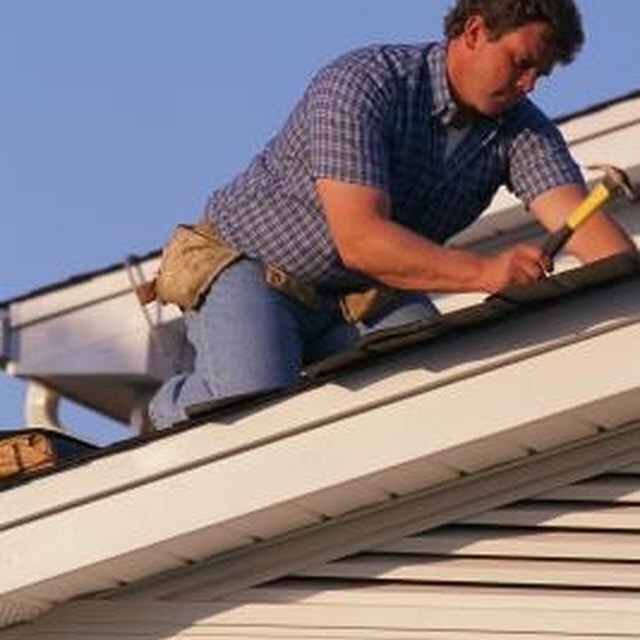 Pull the existing shingles from the roof and discard them. You can pry off both the shingles and their roofing nails (or tacks) using the flat pry bar. If upon removal, significant damage is found to the existing roof structure, repairs should be done as necessary (patching existing tar paper, wood sheathing, etc.). Lay a metal roofing panel in a bottom corner of the roof surface and fasten it per the metal panel instructions; metal roofing materials are available in several styles that require different fastening applications, but are most commonly screwed to the roof framing or sheathing material and should be fastened using 2 1/2 inch screws. Lay the next panel toward the roof ridge, overlapping the first panel by about two inches (unless otherwise noted per panel requirements), and fasten the panel to the roof structure as in Step 2. Continue setting panels to the roof ridge, and cut the last panel to fit using the circular saw if necessary. Continue this process for the following rows across the roof to the opposite side. Repeat steps 2 and 3 on the remaining roof surfaces, and add a roof ridge cap to complete the metal roofing system (the roof cap is a V-shaped metal panel with the same contour as the metal roofing panels). When working on a roof without plywood sheathing, you can measure and mark the roof rafters using the tape measure and chalk line (roof rafter spacing is most commonly 24 inches on center from the roof edges) or an electronic stud finder. Wearing work gloves can prevent cutting your hands when working with metal roofing panels, and safety glasses can protect your eyes from metal shavings when cutting metal panels.